Tablet PC is famous as a replacement for notebook or nettop due to its touch screen capability. But if you still experience difficulty especially when doing some typing or documentation work and is looking for a Bluetooth keyboard, Jorno has a new solution for you. 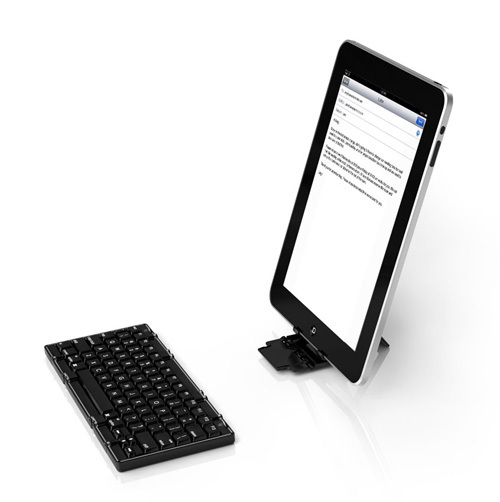 Regardless if you are using Apple’s products such as iPad, iPhone or Android based tablets or smartphone products, Jorno keyboard is compatible to work using Bluetooth wireless link as a great mobile companion for all. One of the major advantages of this Bluetooth keyboard is its compact pocket size that can be folded for easy carry while traveling around. In order to fit into its tiny dimension, the QWERTY keys that are 15 percent smaller than standard size keyboard’s key doesn’t add much inconvenience to average users. Besides, its detachable cradle can serve as a holder to hold your device in both portrait and landscape orientation with adjustable viewing angle at your own convenience. When all are set in the right position, a new Bluetooth wireless link can be established to link both up for seamless wireless connection. Good thing is, its built-in rechargeable lithium ion battery is claimed to be able to last for a month of wireless usage with a single charge (can be easily recharged using its bundled Mini USB charging cable). Even though Jorno keyboard hasn’t been officially shipped to consumers yet (until early 2011) , but for those that are interested to grab one, they can start pre-ordering now at Jornostore at a special price of $79, which is $20 saving as compared to its official retail pricing of $99.